Sunday Spotlight is a new weekly feature hosted on PrintedWordsAnd highlighting the best book read during the week! This week I took part in the #AYearAThon Read-a-Thon with the month's topic being Middle Grade. 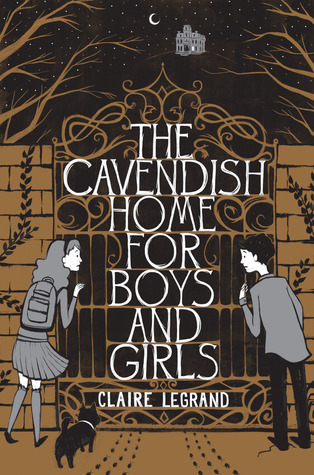 Claire Legrand's The Cavendish Home for Boys and Girls wins a place in the spotlight this week, and here's why! The Cavendish Home for Boys and Girls follows Vivian Wright into the local children's home kept by Mrs Cavendish. Vivian's never taken notice of the home before, not until her friend Lawrence Prewitt goes missing. I did not expect this to be as creepy and compelling as it was. It's definitely middle grade, but with a spark of grotesque horror that was both thrilling and fascinating. I loved it for it's creativity. Legrand definitely stretches reality to deliver this story and her writing doesn't let her down. It's descriptive and straight to the point - which I find is a big positive in any middle grade novel. The plot builds steadily, a little dry right at the beginning, but picks up pretty early on. I'm not sure I loved the characters because I couldn't create a strong attachment, but Vivian seemed like a really believable character and I admire her courage and brains. I also liked that she powered through challenges and grew into a better person by the end of the story. I can definitely see younger readers coming out of this with a fascinating adventure and a minor lesson that they can mirror. My version of the book had small images of roaches pop up here and there on the the pages, which really freaked me out because I have a serious fear of them, so that added to the shock factor as well. Definitely a recommend, especially for younger readers - my brother really liked it when he read it as well. What was your favourite read for this week? I know what you mean, I've only just gotten back into MG and with a little research I've found some that are really great. No worries :) Keep an eye out for more!